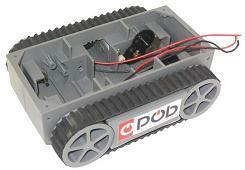 Perfect to realize your mobile robot, this mobile base will bring you great satisfaction. Give mobility to your robot. Mount your own mechanics and electronics on this base. Plastic base pre-mounted including 2 DC motors (6v). Dimensions : 190 x 130 x 60 mm.